August 2009 was the Centenary of Geoffrey Trease’s birth, and to celebrate this, GGBP has republished the first volume of his autobiography, A Whiff of Burnt Boats , which covers the period 1909-1939. 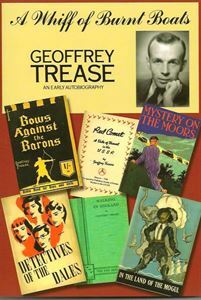 Geoffrey Trease was one of the twentieth century's most important writers for children. This engaging first volume of autobiography covers his radical early years, from childhood in Nottingham to the Oxford degree he gave up in favour of settlement work in London, the early struggles to get his left-wing books published and his visit to Russia, to his marriage and the momentous decision to burn his boats and try to become a full-time writer. Eminent critics such as Marcus Crouch and Margery Fisher considered that he was the major influence on the writing of historical novels for children in the last century, and in this book we see the development of the young writer towards that influential figure. Originally published by Macmillan in 1971, the GGBP edition will include an introduction by Geoffrey’s daughter, Jocelyn, and many fascinating photographs, some of which were in the original edition, and some of which Jocelyn has especially selected for the GGBP edition. Sally Dore has written an introduction to Geoffrey Trease’s publications in this period leading up to 1939, and pictures of some of the incredibly rare books and wrappers are included.